Hi friends! I hope you're having a great day! I'm still battling with this "kidney infection" and I'm beginning to think it might be something else. My tests haven't shown anything out of the ordinary. I have no idea why an infection would be so resistant to 3 kinds of antibiotics. :( Prayers would be appreciated on this. 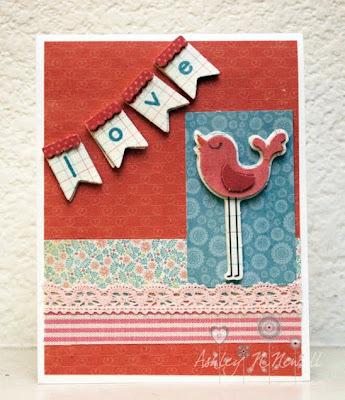 Here's a card I posted today on the Love My Tapes Blog. For this card I used the Light Pink Lace Tape and the Pink Stripe Fabric Tape. All the other elements on this card are from My Mind's Eye, I believe this line is Fine and Dandy. I really hope that they get it figured out soon!!! I feel your pain. I have an auto immune disease and can't even count how many times a Dr. has said let's try this, or if this doesn't work, or I really don't know, let me do some research. BLAH! So sorry to hear that life hasn't been so great of late. It's frustrating when you can't pinpoint the problem! Rest, take it easy, and get better! :( hope you get better soon! And that your medical team figures it out! Love the card- the banner is so adorable!